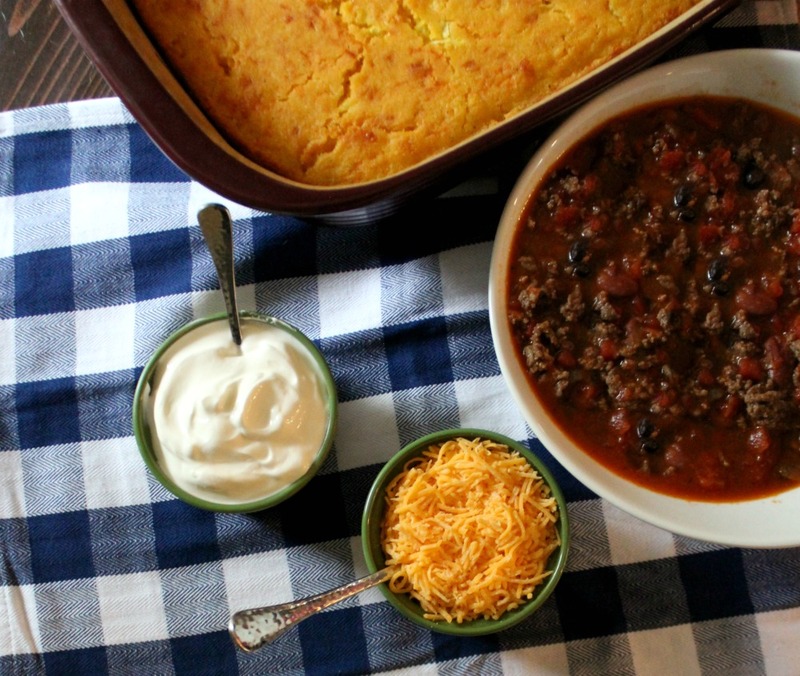 The BEST Chili & Cornbread you’ll ever eat! No, that title isn’t an exaggeration. 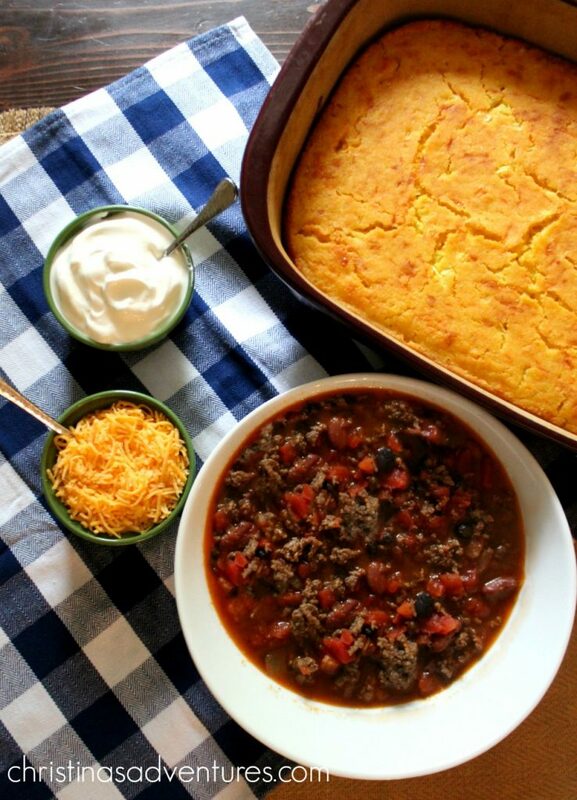 I am in LOVE with this chili & cornbread…and have been for years! It’s the BEST – especially in these fall/winter months. It’s an amazing meal to serve when you have a crowd of people coming over…or just for your family so you can enjoy the leftovers!! I don’t want to brag, but I’m totally going to do it. This chili has entered and won 1st place in the two only two chili cook offs we’ve ever done…it’s that good! The BEST chili - with some secret ingredients that always make it win every chili cookoff! Heat the olive oil, and add the onion, garlic & green pepper in a large saucepan. Cook about 5 minutes. Add taco seasoning, cumin & cinnamon. Stir. Add rinsed beans, and tomatoes (put the juice from the tomato cans into the mixture too). Reduce the heat to a simmer. Cover and simmer for about 1 hour. Once the hour is finished, add the tomato paste and salt & pepper as desired & cook for another 15-20 minutes uncovered. Simply mix all of the ingredients together in a mixing bowl, and then pour into a greased 9x13 pan. Cook for 50-55 minutes (or until a knife is inserted in the middle & comes out clean) at 375 degrees. I don't always add the green peppers - depends on what I have on hand. It tastes great with them, but won't be ruined if you don't add them in. Once the cornbread & chili are both done – cut off a hunk of that cornbread and eat it right in a bowl of chili. If you like, you can add some sour cream & cheddar cheese too! Seriously – you HAVE to try these recipes! It’s been a big hit for everyone I’ve served it to. The cinnamon in the chili & the cheese, peppers & onions in the cornbread make them winners! Looking for another fail-proof recipe? This soup is a FAN FAVORITE, and it’s also one we have almost every week during the fall & winter! oh me oh my oh! How do you print the recipe with just the words and no pics? Yummy! I love chili…and who doesn’t love cornbread? 😉 Your recipe looks great. Visiting from Home Stories A to Z today!